Of the baby boomers surveyed, 80.9% were currently in debt, compared to 79.9% of Gen Xers and 81.5% of millennials. 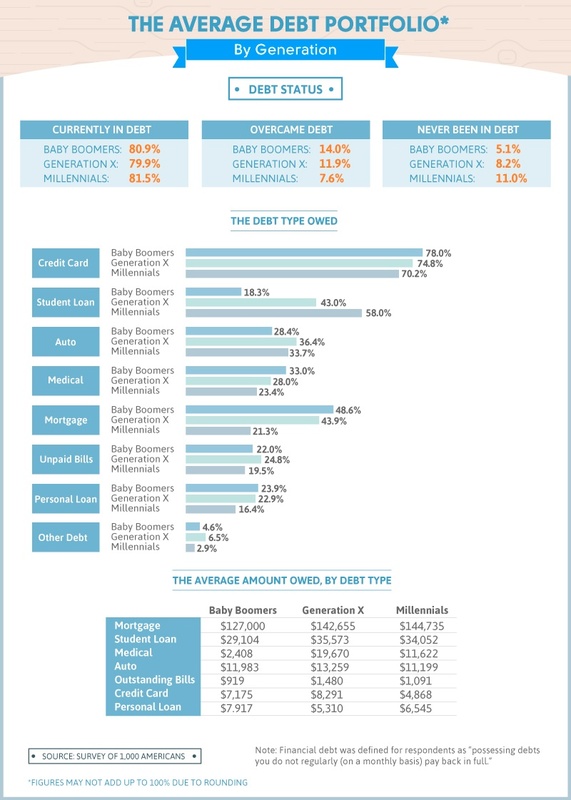 And while the amount of debt was similar, the type of debt varied by generation. For example, nearly 60% of millennials in debt had student loans, compared to 43% of Gen Xers and roughly 18% of baby boomers. A major contributing factor may be the rising cost of a college education. From 1977 to 2016, the average cost of tuition at a four-year public college rose by 146%. Baby boomers led the pack concerning medical debt at 33%, though, while 28% of Gen Xers and over 23% of millennials had the same type of debt. This makes sense, as the older we get, the more medical care we may require. It’s estimated that a healthy 65-year-old couple can expect to pay about $266,600 in Medicare premiums over the course of their retirement. These percentages may seem discouraging; however, let’s examine the respondents who have overcome debt or have never had any debt at all. According to our results, baby boomers were the most likely to overcome debt – 14% completely got out of debt, while nearly 12% of Gen Xers and over 7% of millennials did the same. And when it came to acquiring debt, 11% of millennials said they had never been in debt – the most of any generation. This compares to about 8% of Gen Xers and 5% of baby boomers who have never owed money. A key takeaway from these results is that younger respondents may not have had as much time to accrue debt. 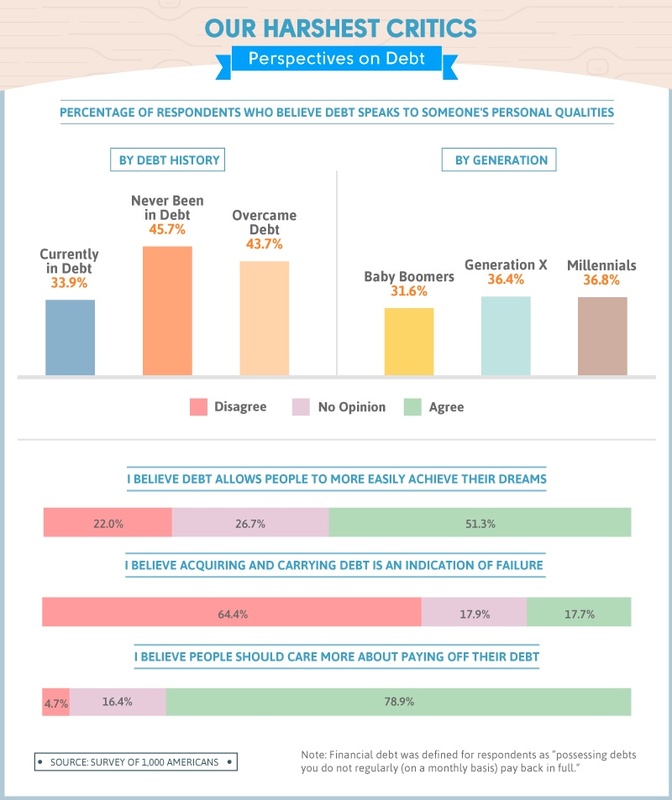 This also aligns with millennials being dubbed as a “debt averse” generation that views debt as an unnecessary burden. When it comes to the average U.S. debt portfolio, our survey revealed a vast majority of people being in some form of debt. And while the percentages were similar across the U.S., the debt Americans experienced varied by location. Less than 79% of those surveyed living in Western states were currently in debt, and more than 12% of respondents from this region said they’d never been in debt before. In contrast, over 82% of Americans each from the East and South were currently in debt, and only a little over 8% of people from the South never incurred debt. Across respondents, credit card debt was the most common financial obligation facing Americans today. More than 3 in 4 participants from the West acknowledged owing on credit cards, followed by nearly 73% of those from the Midwest and about 72% from the East. 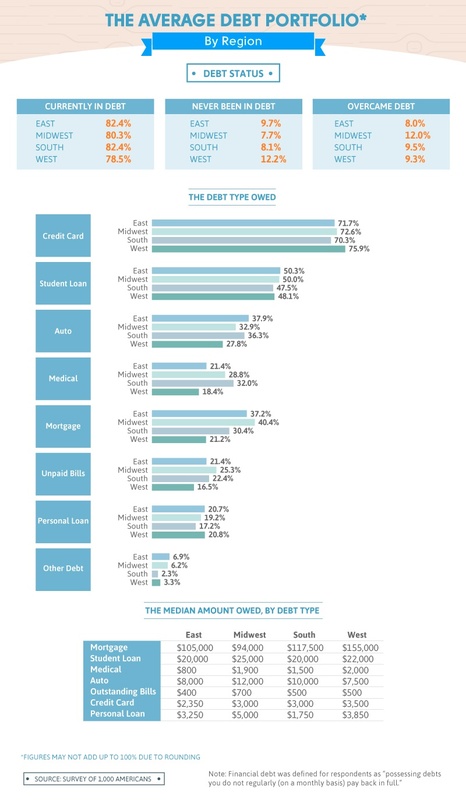 While these percentages may seem high, credit card debt was one of the lowest average amounts owed by those polled. At most, those living in the West averaged just over $7,100 in credit card commitments. Despite relatively high percentages of debt nationwide, we found the two greatest financial obligations were mortgages and student loans. The average mortgage and student loan debt was highest in the West, with over $215,000 on average for mortgages and over $35,000 for student debt. The average mortgage debt in the Midwest, however, was over $100,000 less than the average in the West. Our analysis also revealed 12% of Americans from the Midwest overcame their debt, followed by nearly 10% of people from the South and just over 9% from the West. Next, we asked survey respondents who currently owed money how their debt type affected their quality of life. 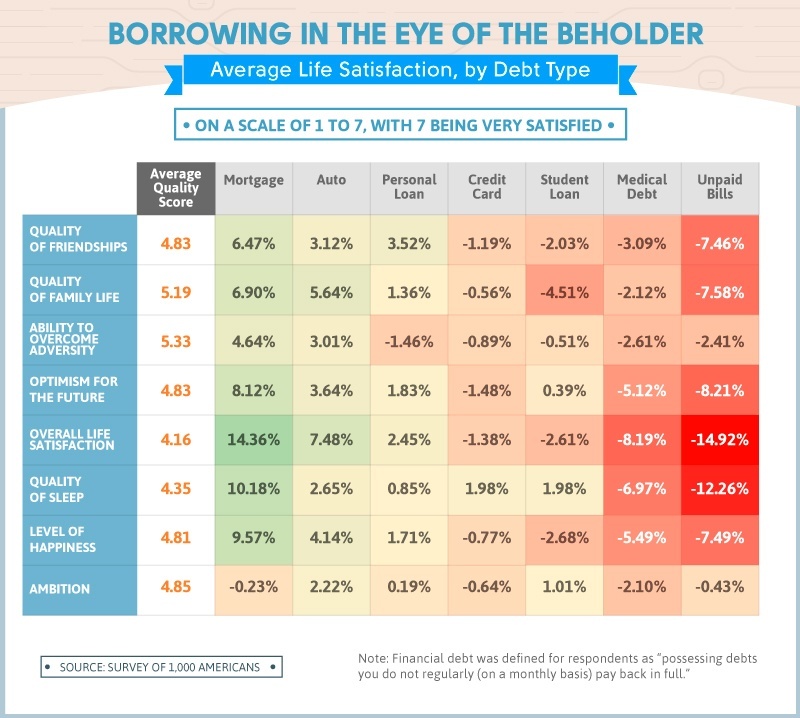 On a scale of one to seven, with seven being highly satisfied, those with a mortgage ranked their happiness a 5.3, while those with auto loans ranked their happiness around a 5. On the other hand, those with medical expenses and unpaid bills ranked their happiness the lowest – a 4.6 and 4.5 respectively. Those with a mortgage also ranked their ability to overcome adversity and quality of family life the highest (around a 5.6 each). Even participants with auto loans ranked their ability to overcome adversity and quality of family life high (roughly a 5.5 each). Respondents with unpaid bills ranked their quality of friendships a 4.5 and their sleep quality a 3.9. However, people with medical debt ranked their overall life satisfaction a 3.8, compared to those with a mortgage at a 4.8. Our findings regarding mortgages and auto loans should be seen as an achievement rather than a failure, though. Buying a home and car are celebrated milestones for some, and they can represent a rite of passage and accomplishment. Other types of debt, such as credit cards, medical expenses, and unpaid bills can cause anxiety and stress, which may stem from a time when things were tight or from superfluous spending and may not be associated with positive life experiences or choices. While paying off debt can seem like a daunting task, it can be overcome – especially with a plan. In fact, our survey concluded that more than 70% of those with debt had a plan to pay it off. Compared to respondents who did not have a plan to pay off their debt, the overall quality of life for those who did was higher across all categories studied. The biggest increase in ranking was regarding overall life satisfaction. 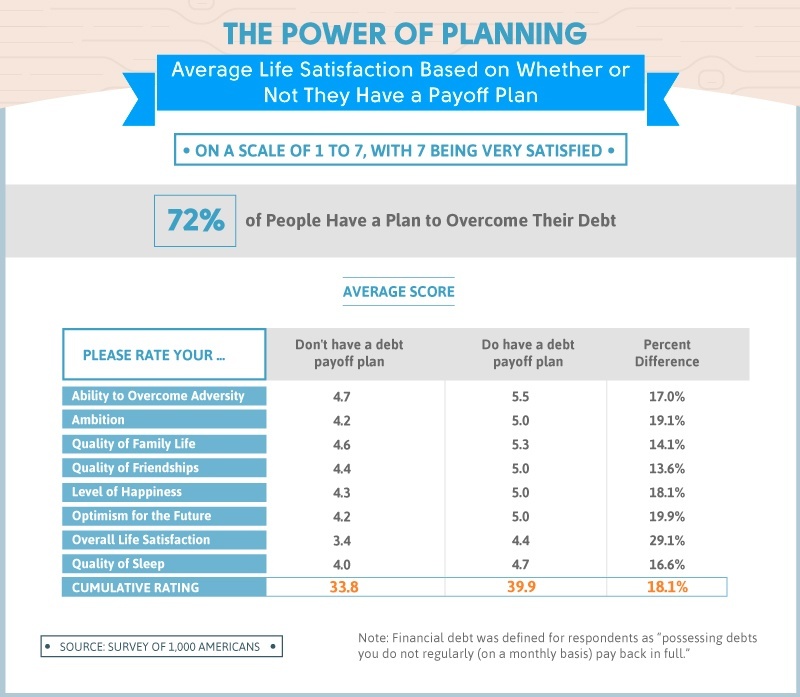 Those who had a plan to pay off their debt were 29.1% more satisfied with their place in life than those without a plan. Optimism for the future and ambition were also ranked higher for those with a plan, reporting a 19.9% and 18.1% difference, respectively. We’ve already established that having a plan is usually the first step in paying off debt. However, some debt is taken on intentionally, while other types of debt are not. Our questions shed some light on those who planned for debt versus those who didn’t. For example, taking on a mortgage is a planned purchase with a set term end date. This type of loan comes with a built-in plan of sorts. However, some purchases, like those charged to a credit card, may add stress and worry to a person’s life if they do not have a payment plan in place. While debt can be discouraging at times, it’s important to remember that it does not have to last a lifetime. 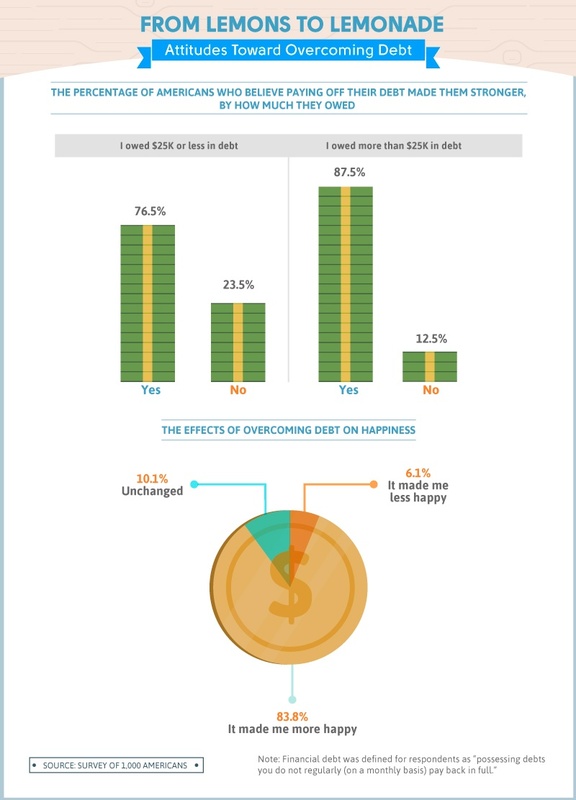 For respondents who had debt and then overcame it, the overall sentiment was that it made them stronger, regardless of the original amount of debt. However, the percentage of people who said overcoming debt made them a stronger person was higher for those with larger amounts of debt (more than $25,000) – over 87% felt overcoming debt made them a stronger person. When all respondents who overcame debt, regardless of the amount, were asked if overcoming debt made them happier, the results were overwhelmingly positive – nearly 84% said they were happier living debt-free. This positive association with overcoming debt shows how large a role it can play in someone’s life and why having a plan to take care of it can greatly improve overall happiness. Using credit or taking out a loan can be imperative in some situations, but it can also be perceived as limiting. 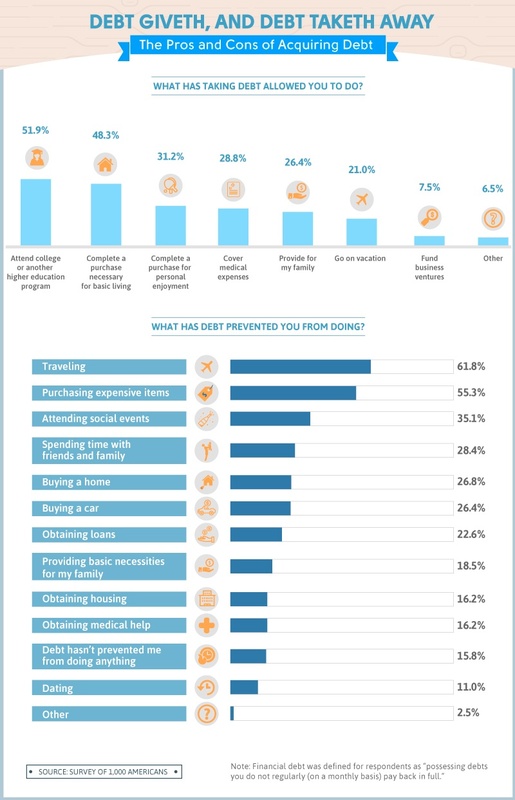 We polled respondents regarding what acquiring debt allowed them to do and which things it prevented them from doing. Twenty-one percent of respondents said acquiring debt made it possible to travel. However, nearly 62% said debt prevented them from traveling. For over 48% of those surveyed, debt allowed them to complete a purchase necessary for basic living, but more than 18% felt debt prevented them from providing for their family. Nearly 29% used debt to cover medical expenses, while over 16% said debt prevented them from obtaining medical help. We asked our respondents how they perceived debt in regard to people’s personal qualities, and across all categories, the majority responded that having debt was not a reflection of the person themselves. This was even true for those who had never been in debt, with over 54% stating that debt was not an indicator of someone’s character (compared to more than 66% of those currently in debt and around 56% of those who overcame debt). In fact, over 51% of those surveyed said debt allowed people to more easily achieve their dreams. As well, more than 64% of respondents said carrying debt was not an indication of failure. Still, nearly 80% said people should care more about their debt. However, caring about debt doesn’t necessarily mean letting it cause stress; it simply means being aware of the debt and having a plan to overcome it. Debt may mean different things to different people. Sometimes, debt can be a means of achieving a goal (e.g., purchasing a home); however, it could be seen as a hindrance when it comes to other goals. Personal situations and priorities can affect these perceptions, based on how and when the debt was acquired and what it was used to accomplish. If you’re looking to take charge of your debt, Nitro can help.